This is our first cd... 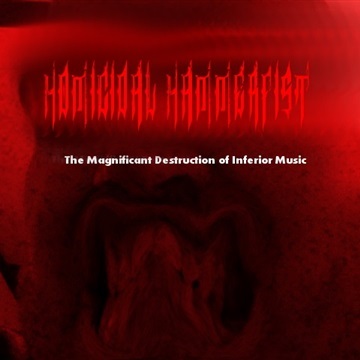 It is a blend of Extreme Power Metal and Black Metal, with all songs being instrumentals... Some songs are more power metal oriented, others are more black metal tinged... I think it came out good... The melodies in it are really dark and hopeless sounding, which is what you need in black metal. I wanted this to be really extreme power metal, so I added touches of death and black metal and used only black metal melodies in it.. The song titles are humorous on this cd... I can't say how long that will last... All I know is that I wanted it to be humorous.. Hence titles like "Ubiquitous flatuator"